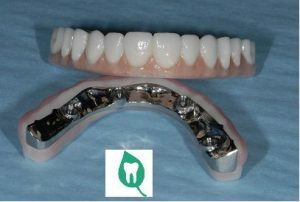 A fixed hybrid is an implant-retained bridge that can permanently replace all of the upper or lower teeth and gums. 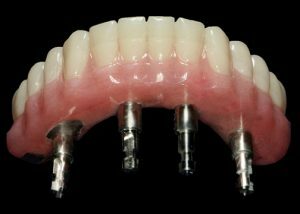 A hybrid is essentially a fixed denture on implants. It is very strong as it has a metal substructure and is fixed to the implants with several screws. Fixed hybrids are one of the options for patients who no longer have any upper or lower teeth or are about to lose them. Thompson Suburban Dental Lab will work with you closely to fabricate the perfect set of fixed hybrids for your patient’s needs. Case selection is crucial to success when considering any form of tooth replacement, including fixed hybrids. Whichever treatment modality is finally selected, it should suit the needs of the patient, be carefully planned and skillfully executed.